I did not know what to expect when I made the decision to go to Haiti on a volunteer medical trip. Of course I did my research so I knew that I would be practicing medicine in a 3rd world country. I knew that we would have a limited amount of supplies. I knew that I would be treating children that may have never been seen by a physician. Despite "knowing" all of these facts, I was truly not prepared. The first couple of days were spent in "Open Door", I could not wait to see the space that we would get to set up our "offices" or the pharmacy that we would be using. However, I was a little surprised to see that the beautiful clinic that was being expanded was dusty and not prepared for patients. I wondered how the patients were going to react to the environment. Even the new electronic infant scale was downstairs but we were going to be seeing the infants upstairs. However, the team was able to rally together to clean the place up, set up our "offices" and set up the makeshift pharmacy. It was amazing to see that a group of strangers was able to come together so quickly for a common goal. I was also surprised to see that the patients were used to being seen in a room with four other patients and without air conditioning. Most shocking of all, was that some of the children came by themselves or with a siblings that was maybe 12 years old. When was the last time that I trusted a 12 year old to give me a proper medical history, I wondered. As the week progressed, I saw that the volunteer group became so good at setting up a clinic and pharmacy setting in a matter of minutes in all of the towns that we visited. 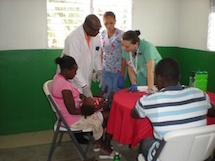 I continued to observe how grateful the Haitian people were for our medical knowledge. The children were so well behaved and some were so ill. I will never forget seeing the 4 month old little boy who only weighed about 4-5kg. His Mom had no more breast milk and no money for formula. For the past one month, this little boy's sole nutrition consisted of Gerber's Apple Baby food. "Hands Up for Haiti" was able to help by buying some formula right that moment and signing him up for the Mamba program. I felt so fulfilled knowing that at least for one child, we made a difference. I left Haiti with a bit of sadness. We were there for only 1 week and helped some children, but what about the countless others that were not seen. What about those children? I can only hope that I, along with others will continue to reach out and help.